Students and faculty from the School of Journalism, Department of Electronic Media Communication and WMOT Radio are still celebrating after attending the Tennessee Associated Press College Awards banquet in Nashville in March. From left to right, MT10 winners are: Chris Davis, Morgan Massengill, Chris Robertson, Marquesha Garmon, Nikki Fells, Brock Howard, Stephen Hart, Christopher Austin, Isaiah Rodriguez, Zac Leonard, Jesse Grace and Taylor Espitee. Sidelines winners are from left: Quint Qualls, Best Investigative Story, first place (co-winner with Emily West, not pictured); Greg French, Best Photojournalist, second place; Laurel O’Neill, Best Illustration/Design, third place. Other awards: Sam Brown, Best Sports Writer, second place; Sidelines staff, Best Website, honorable mention. 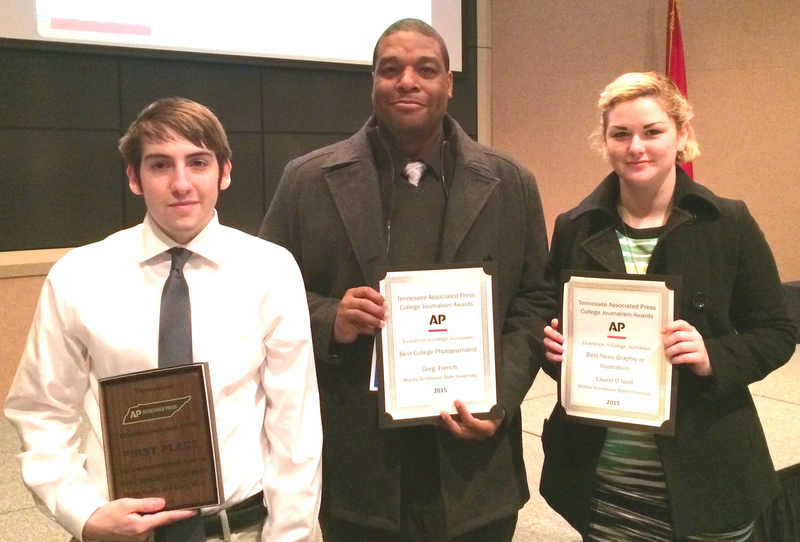 In the broadcast entries, the students took home first place awards in all but one category. The combined work of MT10 Assistant News Director Chris Davis, Senior Producer Matt Parker and News Director Kelsey Lebechuck won best news story, best ongoing coverage, best reporter, best multimedia package and best of show broadcast for their coverage of the Islamic Center of Murfreesboro. In addition, Sidelines Editor-in-Chief Emily West’s website for the Bragg Innovative News Network won for best college media website. Rafferty Cleary and Jordan Taylor’s BINN profile of former MTSU athletic director and football coach James “Boots” Donnelly took home third place for best sports coverage. The sports coverage nominees were all Electronic Media Journalism students, with Justin Beasley winning for his “Kevin Byard Story,” followed by MT10 Sports Director Lena Cline’s “Ebony Rowe Story” in second place, with the Donnelly piece taking third. Davis, Lebechuck and West won best multimedia journalist for the cross-platform coverage using MT10 TV and Sidelines to report fall semester’s Keathley University Center bomb threat. Parker, Lebechuck and Davis’ coverage of the “Woodbury Downtown Fire” won for best spot coverage and second for best television reporter. 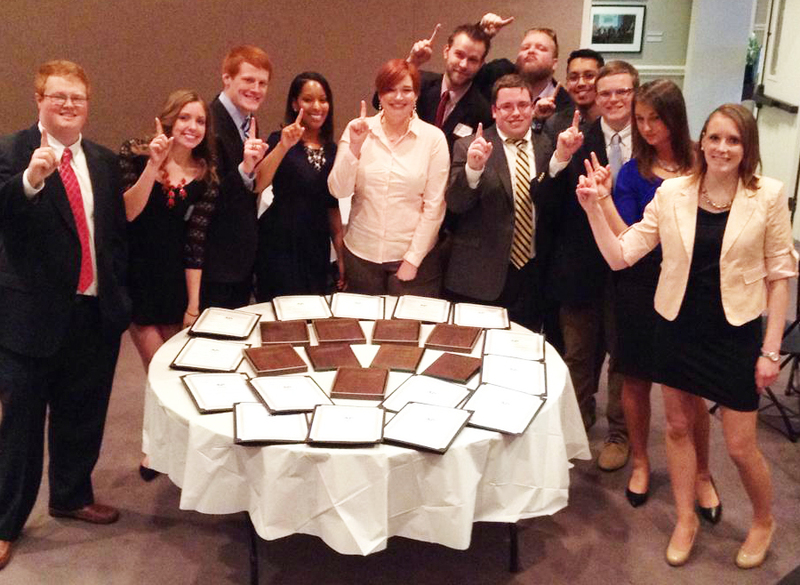 MT10 News also won for best newscast, and Jordan Powell won for best videographer. For best feature story, Davis came in second for his “Pat Yarber Story,” and Jordan Hall, Lebechuck and Davis’ entry “Dead Social Media” placed third. WMOT, affiliated with National Public Radio, took home multiple awards as well. WMOT News Director Mike Osborne won first place in Best Use of Sound Pro and second place in Best Light Feature Pro with “Yodeling is Serious Business.” He also received an honorable mention for “House Concerts” in the Best Writing category. Student Emily Kinzer took home two first place awards, one for Best Radio Feature and one Best for Use of Sound, for “Special Kids Therapy.” Kinzer also received third place in the Best Radio Feature for “Pet Therapy.” Emily West was a first place winner in the Best Radio News Story for “1 in 16 Tenn. Kids Still Without Insurance.” She placed second in the category Best Use of Sound for “Mid-State Musical Lampoons Controversial Senator.” John Sloss took home a second place win with “Afternoon Drive” in the Best Radio Newscast category. Chris Davis and Matthew Follett both nabbed third place nods, Davis with the “Holly Bobo Case Update” for Best Radio News Story and Follett with “Loretta Lynn Profile” in the category Best Use of Sound. For a list of all the winners, please click here.